A Cabarrus County teacher has been charged with taking indecent liberties with a child. Image via Cabarrus County Sherrif Dept. Robert Stanley Enloe, age 50, has been charged with four counts of taking indecent liberties with a child. Local law enforcement indicated that the victim was a student, and the crimes occurred during a one year period over two decades ago, between 1994 and 1995. 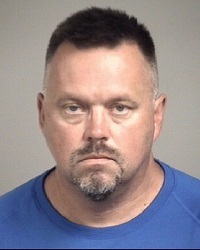 Enloe was arrested July 11 and records show he was given a $1.4 million dollar bond, which he apparently posted overnight as he was released on Friday, July 12. ​ A spokesperson for Union County Public Schools confirmed Enloe had been an employee but not since Dec. 2017. He was the former softball coach at Mount Pleasant High School in Cabarrus County and the last position he held was as a Physical Education teacher and coach at Sun Valley High School. Anyone with information can contact the Cabarrus County Sheriff at 704-920-3000. This entry was posted in CRIME, EDUCATION, LL1885, Quiet Epidemic and tagged Cabarrus County Public Schools, Quiet Epidemic, Robert Stanley Enloe. Bookmark the permalink.